Osel architecture successfully secured planning permission for a new two storey children’s nursery, café and community use building on a former farm site near Shinfield. Osel architecture produced, developed and coordinated the tender information with the professional team. The former farm buildings will be demolished, new buildings constructed and the site will be landscaped. Tenders are due back shortly and it is anticipated that works will start on site later this year. Osel architecture are very pleased to help deliver this fit out project in Wapping, East London. We successfully helped win a planning appeal to convert units back into commercial workspaces for use by Cherryduck- a locally established media company. The ‘Nest’ is an exclusive workspace hub built with creatives, marketers, designers, filmmakers, photographers, animators, producers and everything in-between in mind. Osel completed the measured site survey, design, Planning including the appeal and construction drawings. We also worked with the interior designer and coordinated to secure Building Controls approval. Osel architecture are pleased to be working with GM Developments to help deliver twenty seven new apartments and new sports club facilities in Parsons Green, London. We are pleased to share the second part of the Bursar’s Review – The Independent Schools’ Bursars Association. 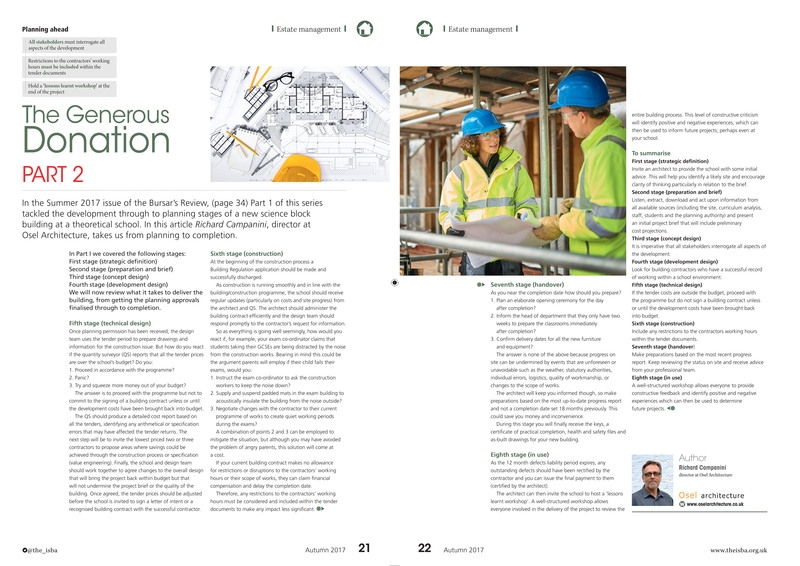 With his experience of construction within the education sector, Richard was invited to share his knowledge on the processes required for the hypothetical delivery of a new school building (RIBA 2013 Stages 5-8).